For twelve years Joel Goldsmith had been searching for the way to live a truly spiritual life without retreating from the world, often feeling on the verge of discovery, but always finding it quietly elusive. The quest continued, and one morning, as he awakened on the island of Maui, the secret revealed itself in a flood of gradual unfoldments. The result of this spiritual discovery is Living Between Two Worlds. This book shows us how to live a more fulfilling and spiritual life at home and at work, without neglecting daily responsibilities. It portrays a way of life that leads us from the world of material sense in which we give power to persons, things, and conditions, to the world of spiritual awareness, where we realize God as the only power and experience the peace and contentment of the inner kingdom. Goldsmith found that the key is understanding the kingdom of God which, as he writes, “does not deal with something separate and apart from living. The kingdom of God concerns itself with our daily life. It is not meant to take us out of the world, but rather to leave us in the world, separate and apart from its negative aspects.” But how is this to be done in the world of our everyday experience – a world of conflict, illness, petty concerns, and greed? What attitude should we take toward the world of materiality that surrounds and envelops us? 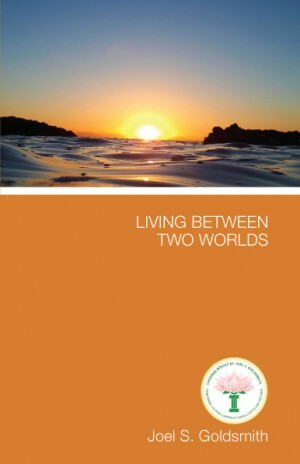 Answers to these vital questions are given in Living Between Two Worlds. This is a book for those who would learn to walk the narrow path which leads to the experience of the Christ within and makes us heirs to the kingdom of God.